Two ladder matches, Ronda Rousey challenging for the Raw Women's Championship, and the latest chapter in the AJ Styles-Shinsuke Nakamura rivalry will take place as the Allstate Arena hosts Money in the Bank tonight. Braun Strowman, Finn Balor, The Miz, Rusev, Bobby Roode, Kevin Owens, Samoa Joe, and one of the New Day members will be in the men's ladder match, while Ember Moon, Charlotte Flair, Alexa Bliss, Becky Lynch, Natalya, Naomi, Lana, and Sasha Banks will be vying for the women's briefcase. 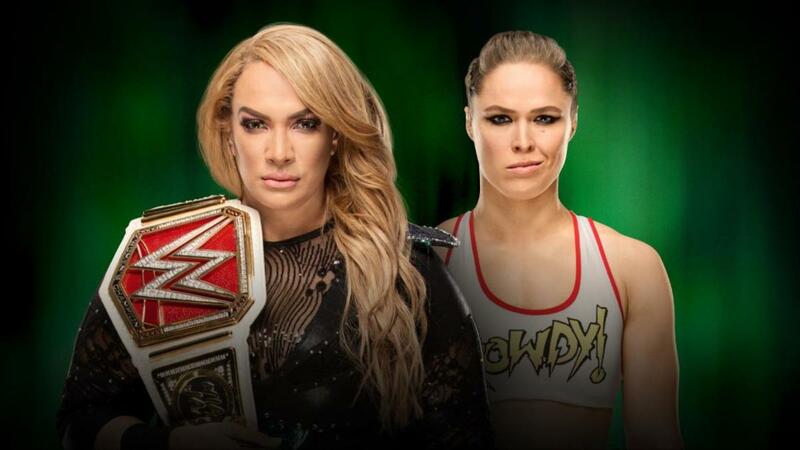 Rousey will have her second televised match in WWE, challenging for Nia Jax's title. Rousey got the better of Jax heading into the pay-per-view as she locked in an armbar and made her tap out at the end of a face-to-face segment. Styles and Nakamura are set for their fourth match on PPV this year, this time with a last man standing stipulation. Also set for Money in the Bank: Daniel Bryan vs. Big Cass, Roman Reigns vs. Jinder Mahal, Asuka challenging for Carmella's SmackDown Women's Championship, Seth Rollins defending his Intercontinental title against Elias, and Bobby Lashley vs. Sami Zayn. Plus, The Bludgeon Brothers will defend their SmackDown Tag Team titles against Luke Gallows & Karl Anderson on the pre-show. That begins at 6 p.m. Eastern time before the main card starts at 7 p.m. Okay match. Gallows & Anderson set up the Magic killer but Rowan broke it up. Then the Bludgeon Brothers did a double-team power bomb on Gallows and got the pin. Felt like a pre-show match and they had less time than usual for the pre-show match which didn't help them. Bryan won with a running knee and the heel hook submission. The crowd was heavly into "Yes" chants. This was better than their match last month but nowhere near what most Bryan matches are going to be. Bryan worked the left knee, Cass did moves like the torture rack. It felt like this was the end of the program and I can't say I'm sad about that. New Day interview. Xavier Woods said he's feeling better after eating the peppers. Kevin Owens shwoed up and said he had gifts, which were pancakes and Maple Syrup. They wouldn't tell Owens which one was in the match. Owens asked the other two to take out Braun Strowman. Kofi Kingston said they don't cheat. Then they said they'd eat pancakes, Owens then said he didn't like pancakes and he didn't like cereal, not even New Day cereal so they got mad and wanted him to leave. Owens said IHOP was smart to change to IHOB because burgers are better. SAMI ZAYN VS. BOBBY LASHLEY. Total nothing match. Short, very little happened. Lshley sold a little early and came back with three delayed vertical suplexes and got the pin. Nobody expected that to be the finish. This match should have been either a shorter flash pin to get Lashley over like a monster or long enough to do a real match. This neither helped Lashley nor was it a good match. Elias did his thing. He said Chicago is filled with scumbags who want attention. The whole place started chanting "We are scumbags" loudly. When people watch this bag historically my God are thjey going to cringe at that. Good match, best so far. Rollins won by reversing a cradle and held the pants to reverse and held on to get the pin. Rollins was bleeding from the mouth early on. He did three different dives. On the third one, Elias sidestepped him and threw him into the post and the steps. Elias showed good intensity in the last minute or so but seemed a little slow earlier on. It was one of Elias' better singles matches. Interesting they had Rollins win with a total heel finish. Not sure what the mentality behind that was. I guess they want people to subtely like Elias. This was really a hell of a match. Ember Moon and Naomi were the real stars of the match but everyone looked good. The story was that Lynch had it won and Bliss tipped over the ladder and Lynch fell on her face onto another ladder and Bliss climbed up and pulled down the briefcase. Banks took some crazy bumps. Charlotte did some spears where she's go under the ladder to do them. Typical climbing and pulling down. You could tell the practice was really a good thing even though some people think for whatever reason that's a bad thing because it would rarely be done in the past. Kurt Angle was celebrating that Bliss won in front of Paige. Angle talked about getting to see Daniel Bryan and Samoa Joe and Paige thought he was trying to raid the roster. Baron Corbin showed up and Paige made fun of him failing last year to cash in. Angle thought it was funny Paige running down Corbin. Sunil Singh is in a wheelchari, wiht his arm in a sling and his neck in a neck brace. This was supposedly from the Reigns-Singh match on Tuesday. Singh came out of the wheelchair about two minutes in and threw Reigns into the post. So both these guys worked real hard. I won't say it was a great match, but the crowd spent the entire match doing chants that had nothing to do with the match and were trying to ruin it. The problem is Vince will see this as the crowd being electric while the fans were spending so much effort trying to ruin the match. Singh tried to get out of the wheelchair a second time but Reigns blocked going into the post. Reigns gave him a Superman punch and he took a bump over the wheelchair. Reigns speared Singh on the floor. Mahal got a quick near fall but Reigns hit Mahal with a spear for the pin. Katie Millar who was in a Special Olympics clip was at ringside and the fans chanted her name. Kind of a boring match because the one thing about Asuka matches is the crowd doesn't buy her selling and the whole match was her selling. Carmella had good poise but it just wasn't good at all. Carmella did look good in the last few minutes. The end saw Asuka in control when James Ellsworth came out dressed up as Asuka. Asuka was distracted forever. Ellsworth eventually unmasked and Carmella kicked Asuka in the head for the pin. A lot of the crowd knew it was Ellsworth, there was a chant before he unmasked, but not super loud. His unmasking got a big pop and the crowd cheered Carmella's win. They were just happy they got a newsworhty event. They had a 31:00 match. It was actually boring much of the way but the last few minutes were great. The crowd was probalby the hottest the entire show for last minute or so. Really nothing happened that was much and all the breaks for the count cost momentum. Nakamura finally hit a low blow on the floor but Styles got up. Nakamura gave him a Kinshasa but Styles got up before ten. Styles gave Nakamura a Styles clash off the ring steps to the floor but Nakamura got up again. Styles gave him a low blow and on the floor but Nakamura still got up at ten. Styles did the springboard clothesline to the floor and they both went through a table. Styles got up before the ten count and Nakamura didn't. This would appear to end the program so Styles needs a new opponent, who could be Samoa Joe. This ended up beign a great deal. Alexa Bliss interfered and destroyed Rousey and Jax with the briefcase and then hit Jax a few more times with the briefcase and hit twisted Bliss to become champion. Rousey had Jax in the armbar when Bliss broke it up. Jax vs. Rousey was real good. Rousey has an intensity and a face that connects really well. It was all planned out and such but Rousey really is a natural at this. Her selling was far better than one would expect, her comebacks looked good. The match itself was exciting and the whole scenario with the title change was great. This built up a Rousey vs. Bliss match at some point going forward. Braun Strowman won the contract meaning Raw won both matches. Finn Balor, Strowman and Kingston were all climbing the ladder. Kingston was on Strowman's back. Strowman threw Balor off the ladder and then flipped Kingston off the ladder nad pulled it down to win. This was a great match, usual quality of a Money in the Bank match. Kevin Owens took a crazy bump off about 13 feet of a 15 foot ladder that Strowman threw him off through a table near the stage area. There were a lot of highlights. Joe and Strowman both had their elbows cut up. Joe did an elbow suicida on Strowman. Balor did a running flip live nad Kingston did a stage dive. Balor came off the top of a high ladder outside the ring doing a coup de grace on Roode who was in the ring. They really pushed the idea of Strowman vs. Lesnar here. We'll be back in a few hours talking over the show.